The second trimester of pregnancy has left me much more functional and energized. Now that I'm back into the habit of a "regular" workout routine, I thought I'd start sharing some of my prenatal workouts with you in case you'd like to follow along or get some ideas for your own prenatal workout routine. And really, this workout would even be great for someone who isn't expecting. 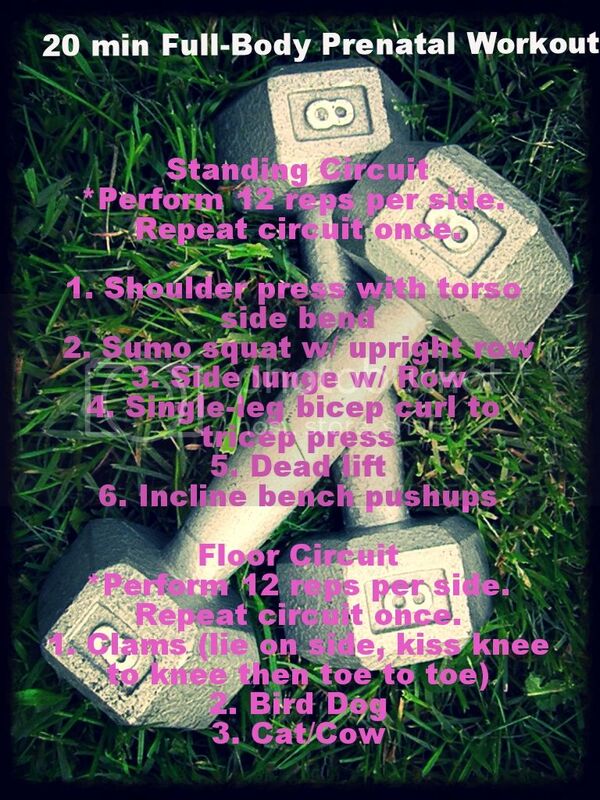 If I weren't pregnant, I'd probably do each circuit three times, moving faster between moves and increasing the weight. This is the routine I did on my lunch break today, scribbled on a simple post-it. I had a good stretch afterward (ohhhhhh yeah) which brought total workout time to about 25 minutes. Choose a weight that you don't struggle with. I chose 5# for most of these. It's better to decrease weight and increase reps from your normal routine than to use a heavier weight for fewer reps during pregnancy. You should also not be working past the point of being able to speak in full sentences. If something doesn't feel comfortable, don't do it. Take it easy momma! Always check with your doctor concerning your exercise regimen, especially during pregnancy. These moves are based upon my own limitations and abilities, but you'll want to make sure to get your own all-clear. Some of the stretches I did: shoulder stretch, wall chest stretch, pigeon, standing quad stretch, standing calf stretch and a triceps stretch. Try to stretch the entire body since you just worked most of it, holding 30 seconds per stretch. After the first trimester, it's not usually recommended to lie flat on your back, so that's why most of my stretches were standing or sitting variations.